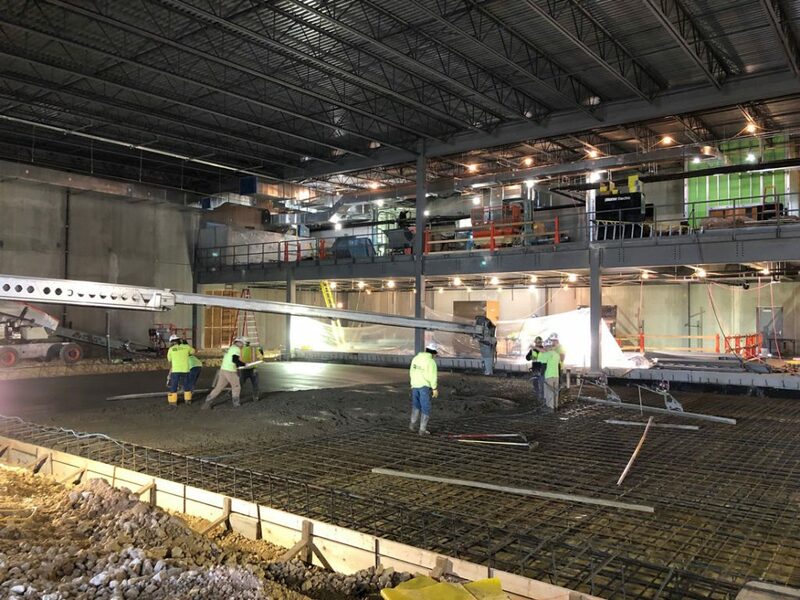 NorthStar Expands Beloit Facility | Corporate Contractors Inc.
BELOIT – NorthStar Medical Radioisotopes is staring down a bright year ahead with expected production expansion and ongoing construction at its Beloit campus in the Gateway Business Park. On Tuesday, the company announced it would expand its production of key isotopes used in medical imaging and testing, along with pending Food and Drug Administration (FDA) approvals set to hit this year, according to executives. NorthStar won its first major FDA approval last year to market its patented RadioGenix system to radiopharmacies across the country, with rollout currently on track and products being used for the first time in patients. CCI concrete crews working on a recent 295-yard pour within NorthStar’s 20,000 square-foot expansion. The company’s big 2018 culminated with being recognized by the U.S. Department of Energy’s Nuclear Security Administration as the first domestic producer of non-uranium molybdenum-99 (Mo-99) in nearly three decades. The CCI team is proud of our partnership with NorthStar and we are excited to help bring their vision to reality.